We may pride ourselves on how evolved we are in the 21st Century; we may rate our education and technology at the highest level of achievement in human civilisation; but with sadness and shame we must admit that as a whole, the human species is lacking in moral fibre. Else why, in the famous words of Bernard Shaw, are we making our stomachs free graveyards for the dead carcasses of animals? What we need for the new age is a new diet - or rather a new approach to life and living, which is consciously and purposefully different from living to eat! Rev. Dada J.P. Vaswani is one of those rare and courageous teachers who has the spiritual fibre that is essential to stand up and be counted for a cause he believes in: namely, the right to live of all creatures that breathe the breath of life. The cause he holds dear to his heart is not a fashion or a passing fad of the times. It is deeply rooted in the ancient wisdom of the Vedas which tell us that the One Life, the One spark of the Divine permeates all of creation; and all that is, is a vesture of the Lord. Physical fitness or spiritual growth; belief in non-violence or commitment to the environment; mindful living or compassionate care for all creatures - whatever your belief, vegetarianism must be your choice for a healthy, happy lifestyle that harms none and promotes your welfare. We eat to live, and not live to eat. There are lots of things in life more valuable than the indulgence of your taste for the food of violence. If you wish to cease your slavery to your own appetite, open this book and discover the triumphs and challenges of Vegetarianism - the New Age Diet for the New Age People! As a humble pilgrim on the path, I have been offered the opportunity to meet with several fellow seekers and travelers on the highway of life. Wherever life has taken me, wherever I have travelled, I have learnt valuable lessons, gained valuable insights from my brothers and sisters, my fellow pilgrims. In return, I have shared with them the wisdom of ancient India, the wisdom of our great rishis and the deathless culture that is our heritage as children of this great land. Above all, I have taken the greatest pleasure, and deemed it my priceless privilege to carry to the people, the message of my Master, the treasure of the wisdom that has been left to us by Gurudev Sadhu Vaswani, a great soul unparalleled for its matchless splendor on India's spiritual firmament. I truly believe that these lips of mine are unworthy to lisp his name, and yet it is my life's mission, the purpose of this God given existence upon this earth, to carry his message to as many people as I can, in as many ways as I can, with as much effect and power that I am capable of Whatever I know, whatever I write, whatever I speak and any good that I may have done to others, has been through the grace of my Guru. Rarely do I speak or write, without acknowledging the deep gratitude that I owe to my Gurudev, this great saint, the beloved son of this land, who was a sage and seer in the tradition of our ancient rishis. Every utterance of mine begins with a tribute to my Gurudev; and every discourse includes an exhortation to the audience to imbibe one of his most cherished ideals: the golden rule of the sanctity of all life and the need to practice, in deeds of daily life, the ideal of Reverence for all life. In simple, practical terms, this is an appeal to all brothers and sisters to adopt the principle of Vegetarianism. This book is no exception to the rule! This deep awareness of the need for reverence for all life formed a very essential part of Gurudev Sadhu Vaswani's teachings and has been propagated emphatically by the Sadhu Vaswani Mission. In 1986, we inaugurated the International Meatless Day Campaign, which seeks to initiate an awareness of reverence for all forms of life by appealing to the people to abstain from all food of violence, on November 25, Gurudev Sadhu Vaswani's Birthday. The Sadhu Vaswani Mission is also committed to the building of a new world order based on the principle of non-violence and reverence for all life. To this end, we have established the SAK -Stop All Killing Association based on the philosophy expounded by Gurudev Sadhu Vaswani, who is hailed as a Prophet of Compassion and a modern day Saint. The aim of the SAK Association is: • To create and foster reverence for all life, in the belief that ALL life must be regarded as sacred, for this is the first step towards World Peace. • To work towards drafting a charter of Animal Rights. • To create a belief in the Brotherhood of all Life. 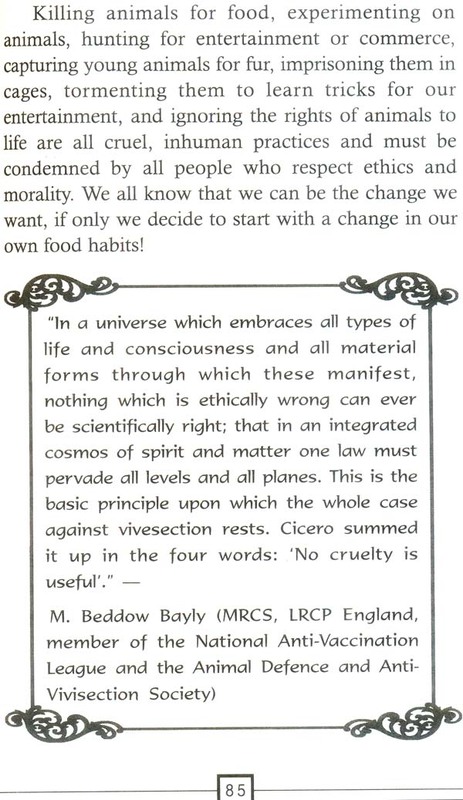 • To promote and propagate the practice of vegetarianism. To this end, we have been celebrating Gurudev Sadhu Vaswani's Birthday, November 25, as World Animal Rights and Meatless Day. It is our hope that the token observation of Meatless Day and Animal Rights Day will eventually sow the seeds of a totally vegetarian way of life in the minds of many. Gurudev Sadhu Vaswani's spirit, I believe, speaks through my weak words when I tell my listeners with undying emphasis: The time has come when we must decide, once and for all, that all types of human exploitation must cease. We must recognise the moral inviolability of individual life - both human and non-human. Just as one race of people cannot exist as resources for another, even so, animals cannot continue to exist as resources for human beings! Sometimes, friends and well wishers say to me, not without a trace of embarrassment, "Dada, we are amazed that you have the courage to stand up before a mixed audience of a few vegetarians and a vast majority of non-vegetarians, and appeal to all of them to refrain from flesh food! How do you do it? We have heard about what is called the courage of conviction; but aren't you afraid of courting unpopularity, of offending people's sentiments when you raise your voice against the food of violence?" I say to them with a smile, "How can any offence be taken when no offence is meant? Is it not a good thing that we share with our friends the best that we have and hold? And besides, what I hold up before them is not a personal whim of mine. It is the essence of India's ancient wisdom, the essence of the Vedas. For it is Vedanta that teaches us that there is but One Life in all. The One Life sleeps in the mineral and the stone, stirs in the vegetable and the plant, dreams in the animal and wakes up in man. Creation is one family and birds and animals are man's younger brothers and sisters in this beautiful family. Is it not then, our duty to guard our younger brothers and sisters from the cruel knife of the butcher?" To the readers of this book, let me say: I do not apologise for my dearly held beliefs. No offence is meant when I plead the cause of vegetarianism. I am convinced, on the contrary, that it is the right choice of diet, indeed, the diet of the future, for a happy, healthy, harmonious life for all humanity! Dear readers, you would all agree with me when I say, these are troubled times, indeed turbulent times that we live in. Insensate violence and strife are all- pervasive. Murder, mayhem, corruption and cruelty have become the norm of 'news' content to which we listen daily, too numbed even to react. Very occasionally, we revolt in horror, only to relapse into our habitual apathy. But beneath the veneer of indifference, beneath the numbed response to the violence, there is the despair of the thinking mind, the sensitive heart: what can I do? How can I make a difference? The answer is clear: we must make a start; we must make a difference, in our own, small, humble way. We must learn to live at peace with ourselves. We must learn to live in harmony with Mother Nature and God's Universe. We must learn to live and let live. We must feel at one with all of God's creation. We must recognise and respect the inviolate sanctity of all life! We do not require manpower, materials, resources and backup to do this: all it takes is a little sensitivity, a little compassion, a little self-discipline and commitment to the values of ahimsa. And we will be amazed at the difference it makes to our lives and attitudes. The change that we seek can begin with as simple a thing as our diet. Man cannot live without air, water and food. While air and water are available to us in the natural state, food is selected, prepared and eaten by our own choice. My appeal to you through the pages of this book is: make the right choice for your food practices! 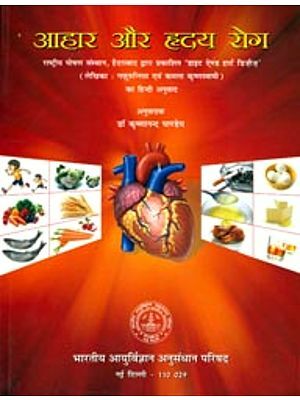 In practical terms food can be of two categories: food of violence or himsa- food that includes fish, flesh and fowl; the alternative is the food of ahimsa or non-violence - in other words, a vegetarian diet. During the last fifty years or more, medical experts and nutritionists have largely inclined to the opinion that a vegetarian diet is the best option for good health. This book is a humble effort to promote that option. It is my firm belief that the food of non-violence is the diet of the new age; vegetarianism is the way of life for the Twenty First Century - indeed, for the new millennium. Vegetarianism is no longer the diet of the neglected few, the freak or the eccentric. 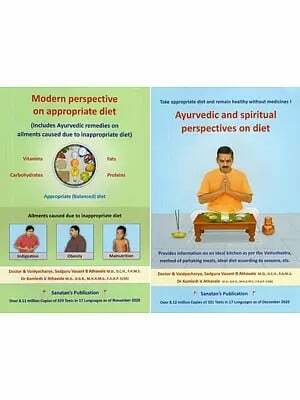 People all over the world are turning to a vegetarian diet, for it has been recognised as a way of life which promotes health and the ancient rishi of the Ishopanishad sang, Ishavasyam Idam Sarvam: all that is, is a vesture of the Lord. God comes to us, putting on different vestures, different garments. Clad in different garbs, the Lord comes to us to test us, to find out if we truly love Him, as we say we do. Alas! We slay the Lord! We handle Him roughly, we treat Him harshly! We offer Him worship in temples and churches; we chant hymns to His glory - but out in the street we are cruel to Him! We slay Him and eat His flesh! We forget that the animal too, is an image of God! The Tamil Saint Thiruvalluvar asks us: "How can he be possessed of kindness, who, to increase his own flesh, eats the flesh of other creatures?" Are you aware, that on an average, a person eats 7500 animals in a lifetime? The time has come when we must decide once and for all, that all types of exploitation, all types of human tyranny must cease, if we are to have lasting peace in the world. It is only through a shared reverence for all life that the dream of world peace can be turned into a realisable goal. Every animal has some fundamental rights - and the time has come when we must formulate a charter of animal rights. This naturally implies a charter of man's duties towards the animal kingdom. The very first fundamental right of an animal is the right to live. No man can take away that which he cannot give. Since we cannot give life to a dead creature, it goes without saying that we have no right to take away the life of a living one, just to pamper our palates and indulge our taste buds. Let us therefore, cultivate what Gurudev Sadhu Vaswani calls "Cosmic Consciousness" - to commune with the earth-spirit, to have a new feeling for the 'animal' world. For the so-called 'lower' animals are also children of Mother Earth. To treat them harshly is wrong. To take them to the slaughterhouse is a sin. This then, is the purpose of this book on vegetarianism - not to preach, but to help you practice a way of life which is bound to be your first step towards a more sensitive, caring, compassionate, healthful way of life. "Yes! These animals are your brothers! Kill them not! Believe me, meat eating will one day be condemned as murder!"